Hot Lab design studio of Milan, Italy, has revealed its exterior styling for the latest Oceanco superyacht concept Primadonna, code name DP028. A focal point is the low and sleek stern, which stands out with a swimming pool on the aft main deck that has a waterfall flowing into a spa tub on the aft lower deck. Notably, the whirpool is enclosed by glass sliding panels, giving a solarium affect and allowing the space to be used year-round and in any weather. Dual staircases lead from the swimming pool area down to the lower deck where a beach club and spa area is tucked inside under the aft main deck. From this point, guests can enjoy easy access to the spa pool or the sea. Accommodations are found within a dedicated owner's deck with bedroom, lounge, gym, and private exterior deck and spa tub, six VIP staterooms – four with their own private balconies – and two additional guest cabins, welcoming a total of 18 guests who will be tended to by 40 staff and crew members. For added owner privacy, access is granted from the touch-and-go helipad on the upper deck bow area directly to the lower part of the owner's suite without having to pass through any guess areas. The Primadonna superyacht concept is proposed with four 4,290hp MTU 20V 4000 M73 engines delivering a top speed of 18.5 knots. 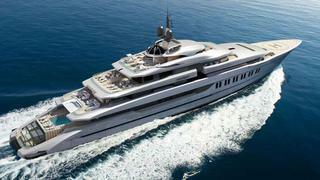 A model of the new Oceanco DP028 superyacht will debut at the Monaco Yacht Show this September.